In addition to the two premier figures of Ay and Horemheb, the names of other high officials who served during Tutankhamun's reign are known to us. Two of them were accorded the privilege of donating objects to the king's burial. One was Nakhtmin, a military officer under Horemheb and a relative of Ay (possibly a son). He presented five large wooden ushabtis, each inscribed with his name under the feet. There is a fine portrait head of Nakhtmin in Cairo, broken from a dyad statue with his beautiful but unnamed wife. 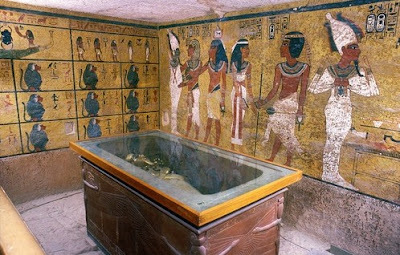 Another official was Maya, who was Tutankhamun's Treasurer and also Overseer of the Place of Eternity (the royal cemetery), where his name is also known from a graffito in a fine hand on a wall in the tomb of Tuthmosis IV recording restorations being carried out, presumably the checking and rewrapping of the royal mummy . To Tutankhamun's tomb Maya contributed a fine large wooden ushabti (again with his name recorded under its feet), and a beautifully carved effigy of the mummified king on a lion-headed bier with two delightful ka and BC birds watching over him. Maya's tomb was located at Saqqara in 1843 by Richard Lepsius when the splendid statues of him and his wife Meryt were removed to Leiden. In 1986 the tomb was rediscovered by Professor Geoffrey Martin through a robbers' tunnel from a nearby tomb. Another high official to have a tomb at Thebes (TT 40) was Huy, Viceroy of Nubia. A vast wall painting, about 17 ft (c. 6 m) long, shows Huy in the full finery of his office presenting the princes of north and south Nubia, together with their families and retainers, to the king. Not least amongst the representations is the entourage of a Nubian princess, she in her chariot, and the vast piles of tribute. This may all be the result of Horemheb's military foray into Nubia.